Through the ups and downs of life, we have moments where we look up to the heavens and wonder - where is God? At times, God can feel far away, distant and unapproachable. The reality for the Christian though, is God is ever-present and with us. 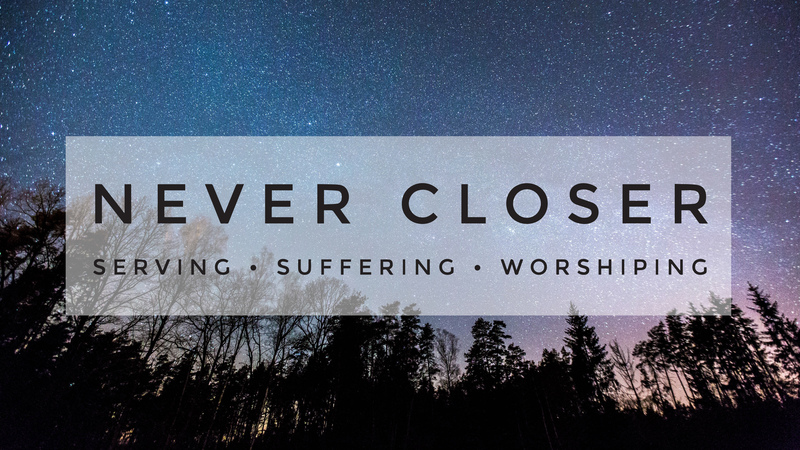 There are three circumstances when we will feel closer than ever to God - in serving, suffering, and worshiping. As Christ came to serve and sacrifice for us, so we are in turn to do to others for the glory of God. From big sacrifices to little acts of kindness, serving others to share the love of Christ brings us closer to God as we begin to understand his infinite love. No matter the source of suffering, God is close to those who suffer. God is full of compassion, never forgets our pain, and the source of all comfort. He takes our pain and turns it into something beautiful if we let Him â€“ a way to help others in times of trouble. Where are you in your suffering? Close to God? Using it to help others? Lean into God during your times of struggle. Rejoice in the Lord! One of the times weâ€™re closest to Christ is when weâ€™re worshiping – when our hearts are poured out to God in praise and thanksgiving for what Heâ€™s done in our lives! When we’re worshiping the Creator of everything that is and will be, weâ€™re Never Closer.